The next strategy for attacking BOB protection involves sending defensive linemen up the field then under the pass set of an offensive lineman. In this example of the NCAA blitz the Mike has been declared the "Mike". The TB is able to pick up the Sam. 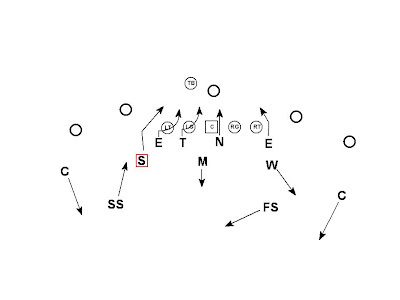 The pressure falls on the LG and LT to handle the exchange of the End and the blitzing "Mike". Unfortunately, offenses are getting better at handling the long stick concept. 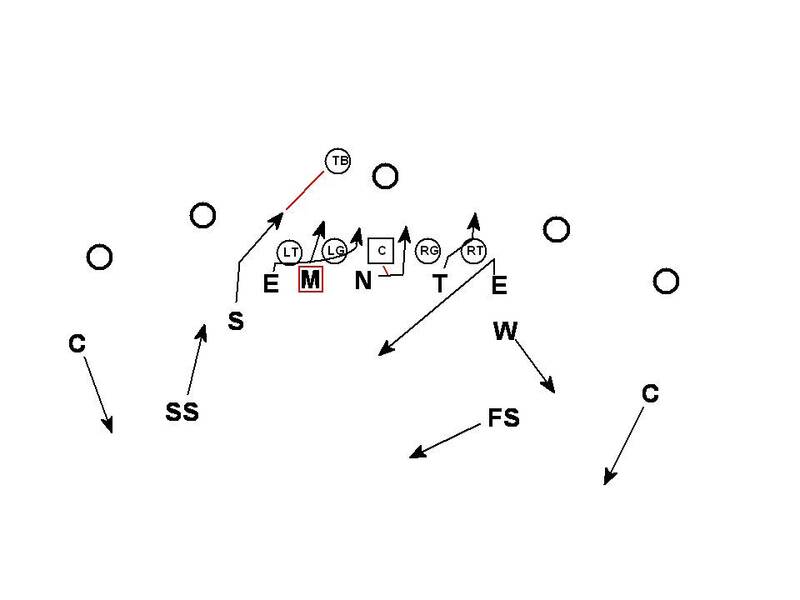 Here is a variation that can be very effective vs. BOB and serve as a nice compliment to the NCAA blitz. Here the Mike is walked up into the B gap showing the pressure or timing it up to hit it running. This forces the LG to pay attention. 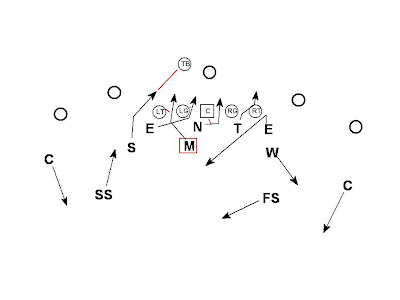 The End jabs up field to hold the attention of the LT then loops to the A gap. Jabbing also helps the timing. The timing of the twist makes the jobs of both the LG and LT very difficult. 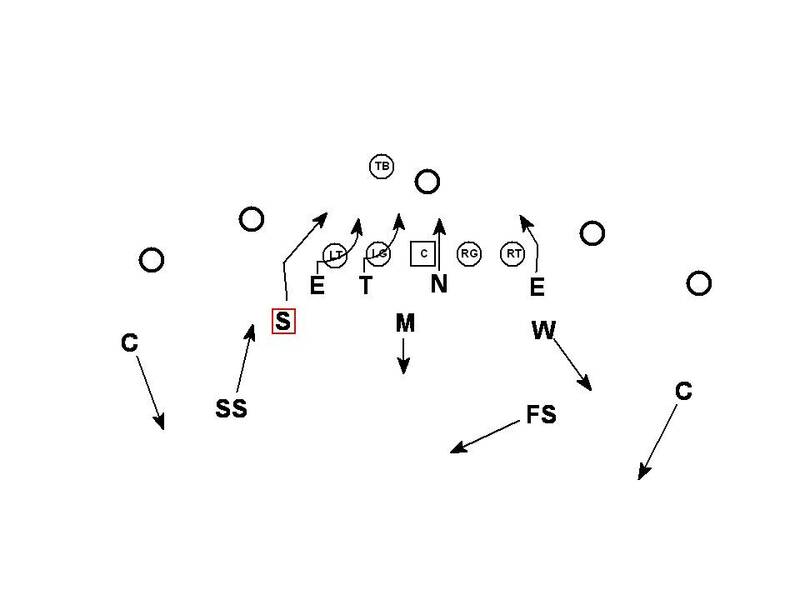 The LT must react back inside to a blitzer who is already gone and the LG must come off a blitzer he is already engaged on to pick up an End he may or may not see. 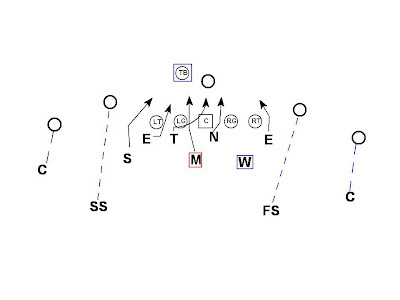 The same up and under concept can be applied if the Sam has been declared "Mike". Here the Sam has been declared "Mike" by the offense. The LG is in a bind. What needs to happen is the LT to pick up the Sam, the LG on the up & under DE, the Center on the up & under DT, and the RG on the Nose. 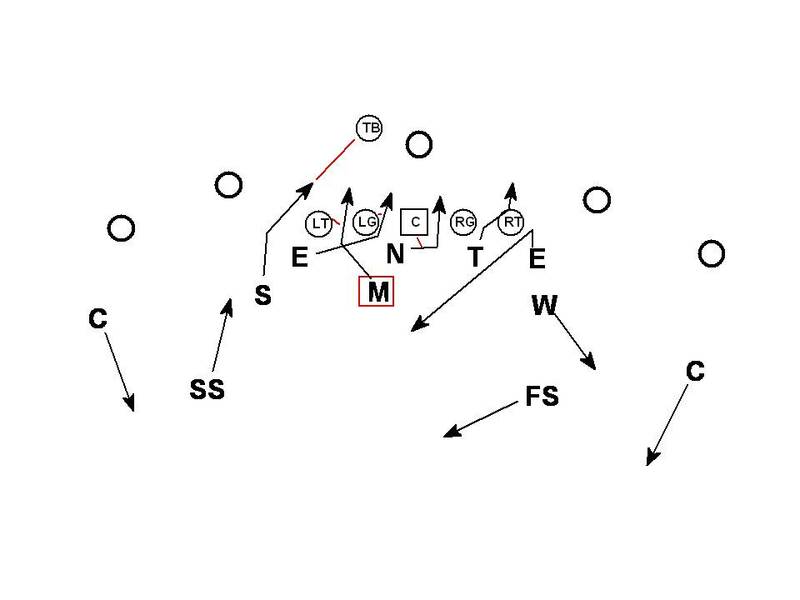 This is problematic for the LG because he has to continue to block the DT on a regular pass rush move where he would rip under this pass set because this is a man scheme. But here the LG must compute the fact that because the "Mike" is blitzing that he has to pass the DT to the Center. 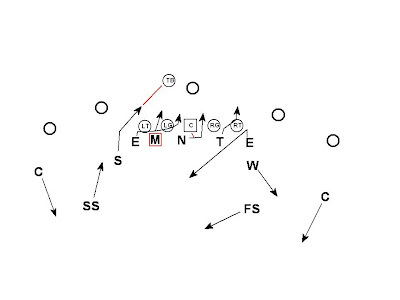 This pressure forces the Center, LG, and LT to all react properly in a fast moving situation. If an offense is prepared to pick this up they have committed a great deal of practice time and therefore haven't spent as much time on something else. Another application of the up & under concept can be seen here. In this example the TB is responsible for the Sam. Once the Center is engaged with the Mike it is hard to see a looping DL. The LG is stuck is chase mode against the DT.